Any chocolatier will tell you how hard it is to make chocolate without fat. After all, cocoa butter's high fat content is what helps the confection maintain its velvety, liquid form during production so it doesn't clog up the machinery. But for manufacturers looking to produce an option that's lower in fat, physicists at Temple University believe they may have found a way to do so, Science reports. The key is a little electricity. As the researchers report in their study, recently published in the Proceedings of the National Academy of Sciences, a process called electrorheology can be used to reduce the viscosity of low-fat chocolate while it's still liquid. The fat content of chocolate usually falls somewhere between 60 and 40 percent; at 36 percent the substance starts becoming too thick to work with. By applying an electric current to low-fat chocolate in the same direction as its flow, scientists were able to make the solid cocoa particles floating in the liquid clump up into chains. These chains flowed more smoothly than free-floating particles, which made it possible for the chocolate to make its way through the machine. 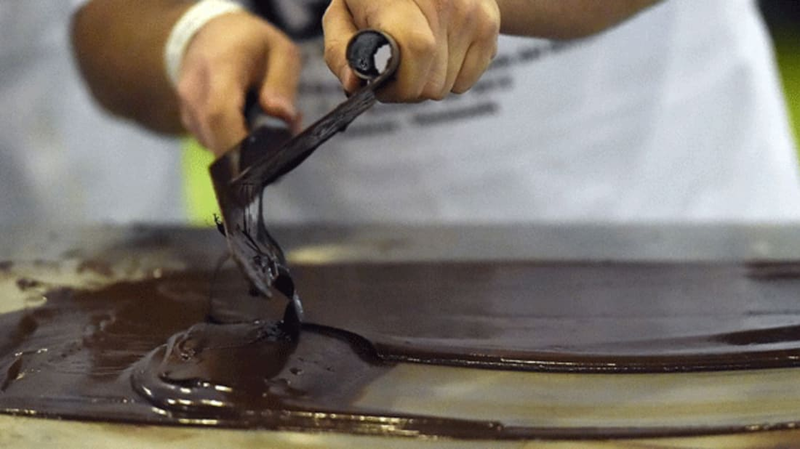 The technique allowed them to produce chocolate that was 10 percent lower in fat. The study received funding from Mars Chocolate, but there's no word on whether or not it will be used in commercial chocolate-making factories any time soon. Even with a low-fat label, the new type of chocolate wouldn't necessarily be a healthier option. It would still contain the same amount of added sugar, which according to the Dietary Guidelines Advisory Committee should only account for 10 percent of your daily calories. Cocoa butter, on the other hand, has been found to have neutral effect on cholesterol despite its high saturated fat content [PDF].